I have had almost everything on the menu but I have made a few favorites. I have had the Filet Mignon a lot and I must say that it is a very good value. So is the Renegade Sirloin and the New York Strip. But the last few times I have ordered the Outlaw Ribeye, 18oz, bone in and fire-grilled. 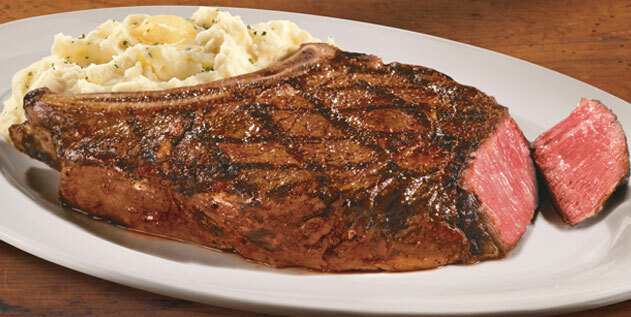 If you've read my earlier reviews, you know that I like my steak cooked "Pittsburgh Medium." When someone orders a steak "Pittsburgh," they mean they want the outside of the steak to be seared and charred and the inside to be rare. Sometimes it is referred to as "black and blue." It is accomplished by putting the steak on an extremely hot grill for just a few moments per side. If the grill "flares up" all the better. So when I order "Pittsburgh Medium," I want the charred outside with a pink medium inside. If you try ordering this way make sure that the wait staff understands that you are not ordering "blackened," which is a Cajun specialty made by pan frying with loads of special herbs, spices and peppers. This time we were three and I had a coupon for a free starter and ordered the "not on the menu" stuffed mushrooms. The five large mushroom caps were stuffed with a melted cheesy breadcrumb mix and they were superb. We followed with three Caesar salads. One of us ordered the Grilled Chicken & Stuffed Portabella, tender grilled chicken breast topped with mushroom sauce and a cheese stuffed portabella mushroom and she really enjoyed it. Josh and I ordered the Renegade Sirloin. 8oz. for him and 12oz. for me. Both with a baked potato and I added a side of their delicious button mushrooms. He ordered his medium rare and I ordered my regular "Pittsburgh" medium. When they arrived his was "Pittsburghed" and mine was medium rare. We told the person who delivered them (not the original waitperson,) but it must not have been important because no one came back to the table. Josh had already tapped into his and seemed happy with my choice so I thought I would just make the best of it and cut right in and started eating. About halfway thru the waitress came by to see if there was a problem. I explained and she had the manager come by. He apologized for the mixup and attempted to remedy the situation in everyway possible. I really wasn't upset aand enjoyed the steak I was eating and for my trouble he gave me a $25.00 gift certificate for my next visit. Three days later I returned with Michelle, Ilona, and Steve. I had another starter coupon and ordered the stuffed mushrooms again. Michelle and Ilona had the Grilled Chicken with Portabella as above. Steve and I went for the Outlaw Ribeye and Steve agreed to try his steak my way, "Pittsburgh" medium. And he loved it!